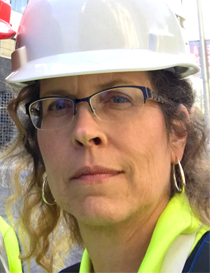 In September 2017, a 7.1-magnitude earthquake hit south of Mexico City, and a management professor in De Pere checked her passport. Lucy Arendt (Business Administration), an expert in decision-making following a natural disaster, would travel to Mexico at the end of the semester. 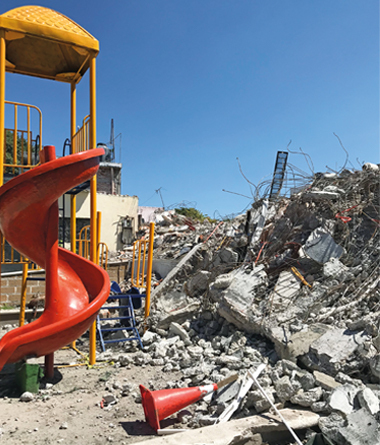 In the aftermath of the quake that killed 400 people, Arendt joined a group of professionals that included structural engineers, geotechnical engineers and public-policy analysts. As a member of the Earthquake Engineering Research Institute’s board of directors, the management professor (pictured left with her team in Mexico, and below) was there to gather information for use by teams to follow. Those later experts will study the impact of building codes, structural damage in the area and recovery efforts to create more resilient communities. When selecting her research area, Arendt says she wanted to focus on how people applied their decision-making to a real situation. “Studying what people do and then sharing it has a huge positive impact,” she says. Her foray into disaster work happened as a lot of things do in life – by chance. A former mentor approached her in 2005 to help research how hospitals implemented Seismic Safety Act SB 1953 in California. Meeting people involved in the field led to work elsewhere. After meeting with a group of health care executives following Hurricane Katrina and discussing with them some of their decisions, her study of decision-making during disasters took off. Arendt, who has an academic background in management science with a focus on strategy and organizational behavior, says she was attracted to the multidisciplinary approach of a field that draws everyone from engineers to sociologists. Prior to traveling, Arendt learns as much as possible about the community afflicted. Once on site, she walks or drives to get a sense of the damage and who was affected. She starts asking a lot of open-ended questions about preparation, response, recovery and mitigation. “Basically, why do people do what they do and how can we help them make better decisions, whether they are more effective, more inclusive or more sustainable,” she says. She also talks with a wide variety of people according to the purpose of her trip: community leaders, CEOs, business and organization leaders, non-governmental organization leaders, members of the news media, school leaders, academic leaders and average citizens. She follows up with reports for her sponsoring organizations. Arendt, author of two books on managing long-term recovery, is currently working on a new book about the 2011 EF-5 tornado in Joplin. She conducts workshops for professionals and community members about what she learns through her research. And she brings what she’s learned into the classroom. Communicating lessons learned and ways to improve means outcomes going forward can be better for individuals, families, businesses and other organizations – indeed, for communities. Lucy Arendt (Business Administration) teaches both undergraduate and graduate courses in organizational behavior, leadership, strategic management and sustainability. Her work in disaster management means working alongside professionals from many fields – an experience that has increased Arendt’s interest in multi- and interdisciplinary activities at St. Norbert. This summer, she’s offering an interdisciplinary, inter-institutional undergraduate seminar on leadership and World Wars I and II that takes place in France, Germany and Belgium.